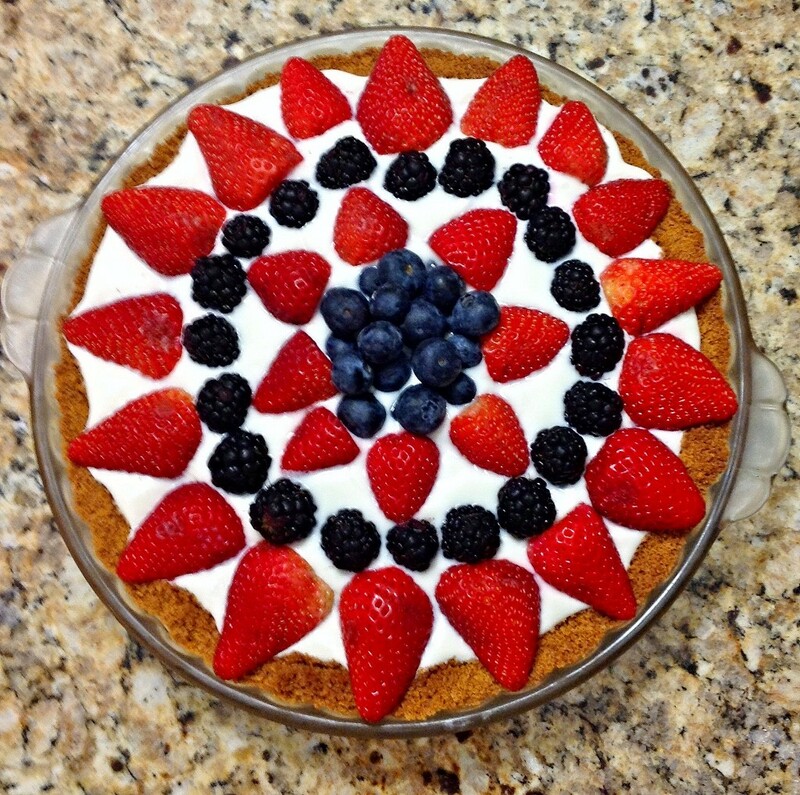 Oh say can you see, by the dawns early light, that the Fourth of July is quickly approaching and we have the perfect, (somewhat) healthier version of a fun and festive pie recipe to share with you! The ingredients are super simple. Basically, you start by making a Graham Cracker crust (you could always use another pie crust of your liking.) We did use the Graham Cracker crust, though, and it turned out delicious. A pinch of cinnamon and other spices to your liking. This is all up to preference, so feel free to add whatever you want. All you need to do is combine all the ingredients in a food processor and you have your crust! We eyeballed the proportions but if you want a more exact recipe, here is a great one. The filling is even more simple to make than the pie crust. We used Fage Vanilla Greek Yogurt which is a healthier substitute to pudding or any other pie filling. That's all you need for the filling because the Vanilla Greek Yogurt should be just sweet enough. You can always sweeten it by adding honey/agave nectar/powdered sugar if you want more sweetness. If you don't want to use the Vanilla Greek yogurt then there are other alternatives. Below is another great yogurt filling recipe. This filling is just as good as using the Vanilla Greek Yogurt. If you are using regular yogurt instead of Greek yogurt, we recommend you strain it before putting it into the pie crust so the crust doesn't get too soggy and wet. Also, if you are not a fan of yogurt at all, you could always use vanilla pudding instead. Now for the fun part: Decorating! We decorated it with berries on top, making the pie prettier and nicer to look at. It really gives it something extra to have the bright colors on top. We used strawberries, blackberries, and blueberries on top and neatly arranged them. Voila! Here is the finished product. It is definitely worth a try, especially for the Fourth of July. The yogurt is white, the strawberries are red, and the blueberries are blue. It really is the perfect recipe for this festive holiday! It satisfies your sweet tooth, but is not overwhelmingly sweet. We hope you enjoy this recipe and have a great 4th of July!